We didn’t need much of a weather window to make Colon from Portobelo, Panama. Just nothing on the nose, please. The weather prognosticators promised such light conditions that we didn’t even take off the sail covers. The breeze slowly built into something useful but by that time I had other concerns. 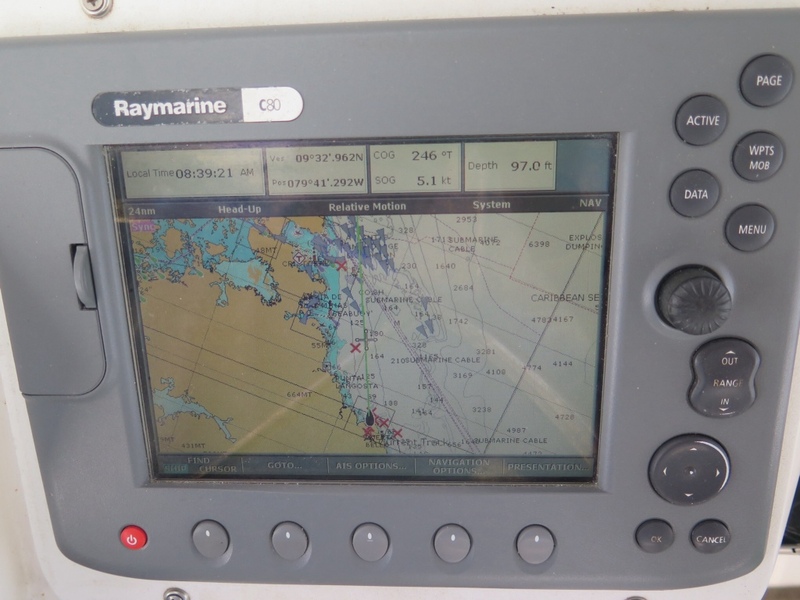 I’d had the chartplotter zoomed way in to negotiate our exit out of Portobelo harbor and when I noticed very few AIS contacts. I zoomed out to twenty four miles. The screen was a solid ball of purple triangles, each one representing one of those 700-foot monsters looking for all the world like thousands of space invaders advancing down the screen at us, some at anchor awaiting transit, some not, some could be a tiny sailboat lost in a solid ball of purple. Who could tell? I don’t mind telling you Dear Escapees, I swallowed hard when that screen came up. You could say that I was a scoshe intimated. 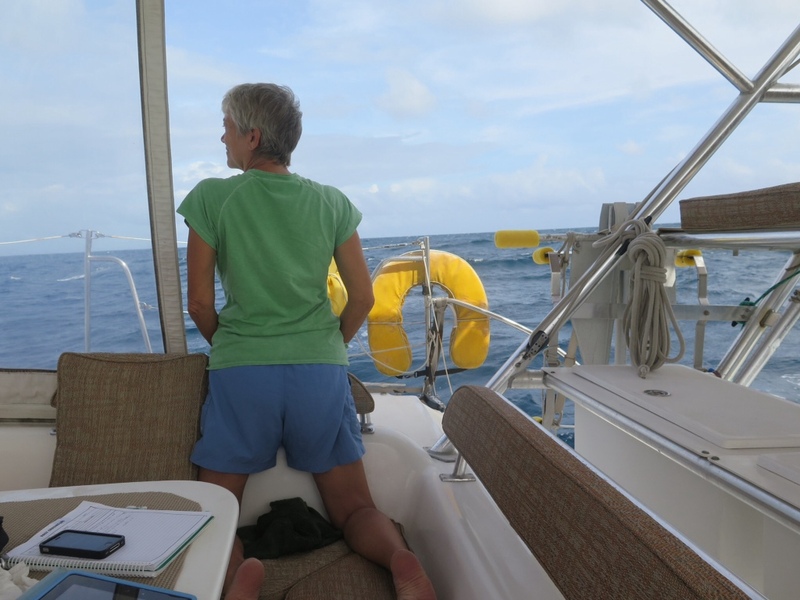 We’d followed a small sailboat all the way from Portobelo but you could never pick her out of the sea of purple on my screen because I would have to isolate one of the contacts to click on it. This is no ordinary crossroads. This is…well…cellophane, as Cole Porter once wrote. As we dodged one space invader after another I kept one eye on the shipping lane which passes through a gap In the magnificent stone jetty which protects the approach to the canal. 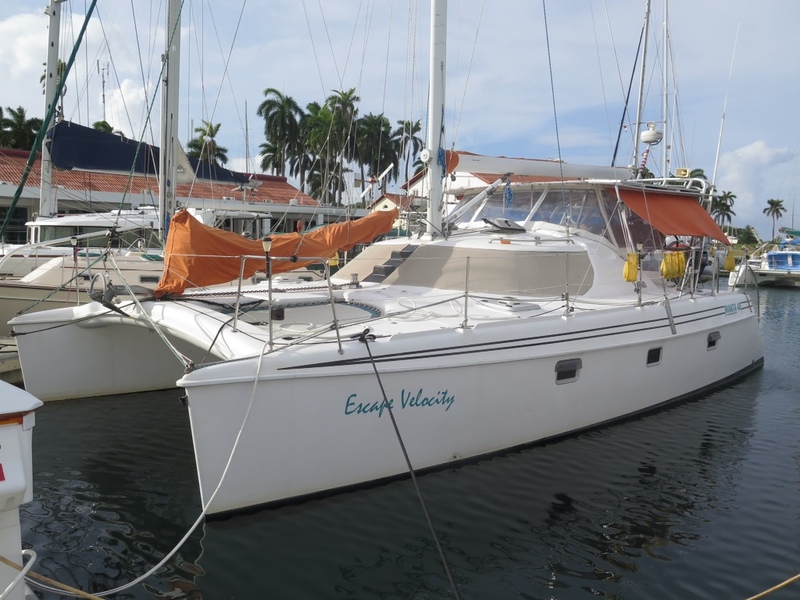 We would be crossing the first shipping lane and entering the second and with any luck at all, after a hard turn to starboard, following the jetty to the entrance of the famous Shelter Bay Marina. While crew ran around trying to remember where we stashed long forgotten dock lines I negotiated the circuitous path to dock E, slip 7 while trying to talk to Frank the dockmaster who apparently has his VHF radio on USA frequencies while ours is on internationalI frequencies naturally, and my brain decides to use this opportunity to draw a blank on the absurdly complicated method to go back to USA frequencies. I chose to pull straight in with starboard side tie. Shelter Bay has a shinypants look to it with prices to match and their welcome package, a photocopied, multi page, stapled together affair, reminds us that the marina is surrounded by jungle and is visited by crocodiles! ‘Nuff said. Our canal agent Erick showed up and efficiently took care of business and said to expect the admeasure guy maybe in the morning. 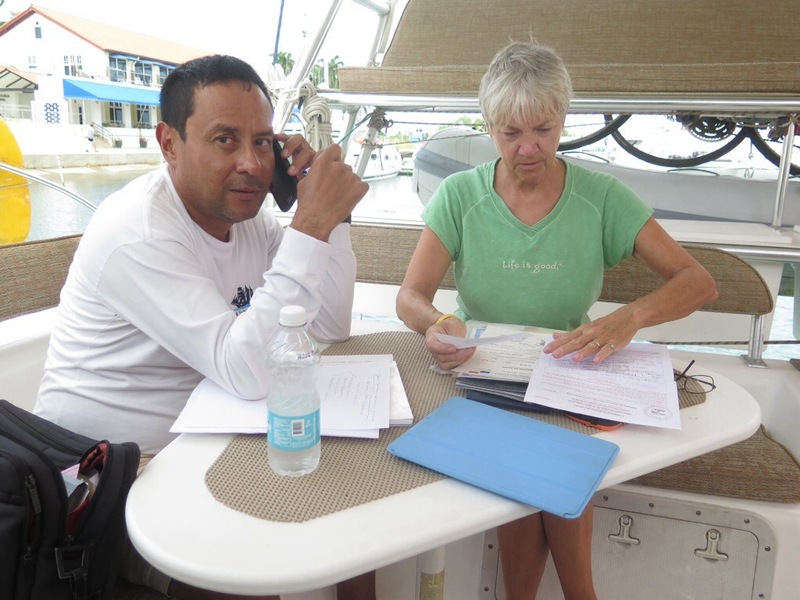 Every boat must be remeasured…every time. 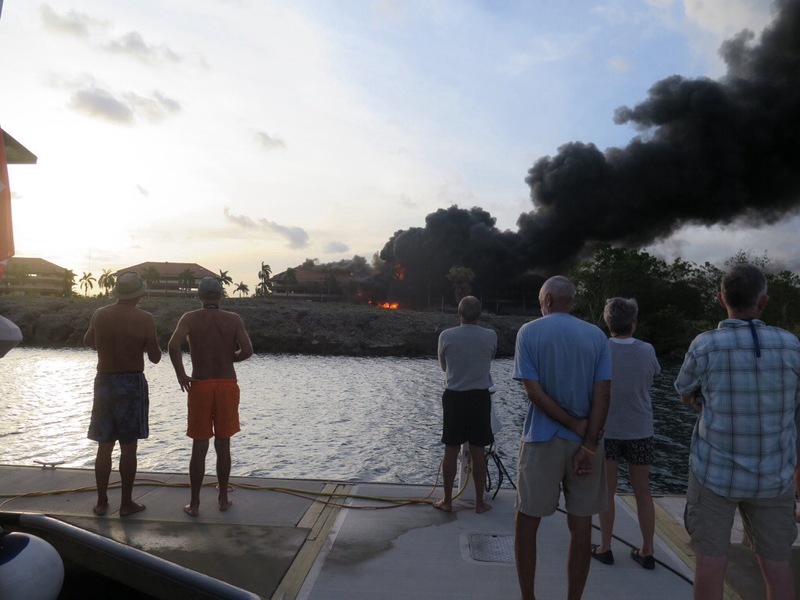 What we saw, first thing in the morning, was a column of thick black smoke rising up from an out building right across from E dock. Somebody at the end of our dock said it was an army barracks which I could believe because large groups of young men often run around here in matching sweat gear shouting and singing. So, as I say, at first it was just burning with no response but soon the very large fuel tanks contained in the out building started exploding. It was like a twenty one gun salute just for us. No emergency response. 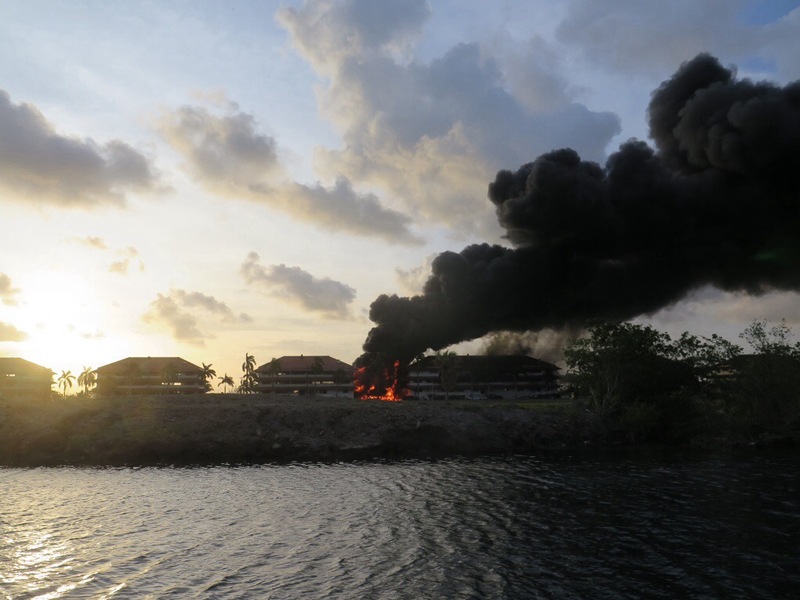 The black smoke really got going then and I have to say that some of the sleeping attire on dock E could stand improving. No response, apparently as one bizarrely dressed sailor said they have no fire fighting stations on this side of the canal. That’s when the three story building next to the out building really became engulfed in flames. No response, some of our coffee deprived neighbors drifted off to make some or at least to put some clothes on. 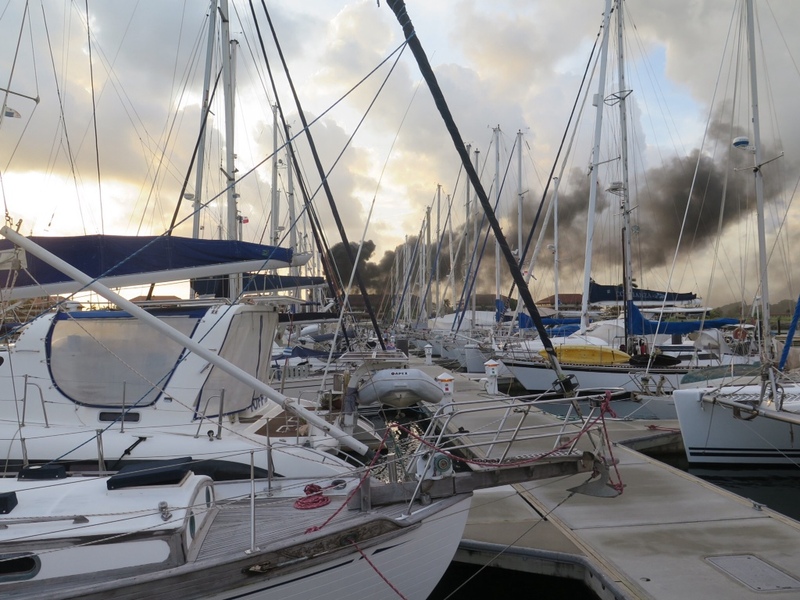 So the fire cut the power to Shelter Bay Marina which stopped all Wifi and exposed a lot of fashion gaffs in our sleeping attire on dock E. If you’re reading this it means that the Panamanian response time for wifi is better than the Panamanian response time for fighting major building fires. I think I hear fire engine sirens. So…while we’re waiting for some firefighting action it’s interesting to note that to transit from the Caribbean to the Pacific one travels south east, that ought to be worth a couple of free beers in a bar someplace.